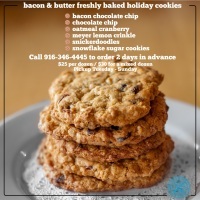 Click here to place your order securely online or give us a call at (916) 345-4445 to place your order at least 2 days in advance. Pickups are available Tuesday through Sunday until December 21st. The cinnamon rolls are a must try!